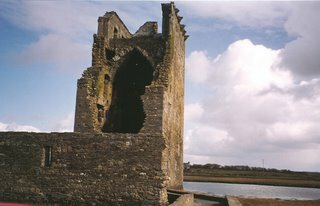 "Irish monasteries provided important economic and political focal points to the Vikings for provisions, precious goods, livestock, and captives. 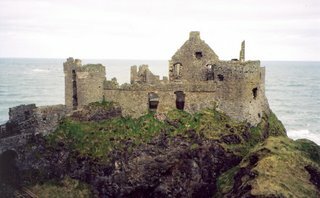 This was also the reason that monasteries were a favorite raiding spot for Irish leaders both before and after the arrival of the Vikings." 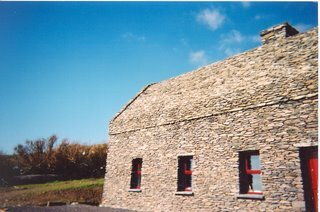 For us, at our earlier visit, Wicklow was the site of an old gaol, jail, from 1702, with only modest reforms easing the conditions, see it at http://www.wicklowshistoricgaol.com/history.htm/ Many prisoners were transported from there to Australia, or the Americas, and even at a profit to the operators. Clonmacnois was founded by St. Ciaran in the 6th Century. Christianity was in Ireland before St. Patrick. 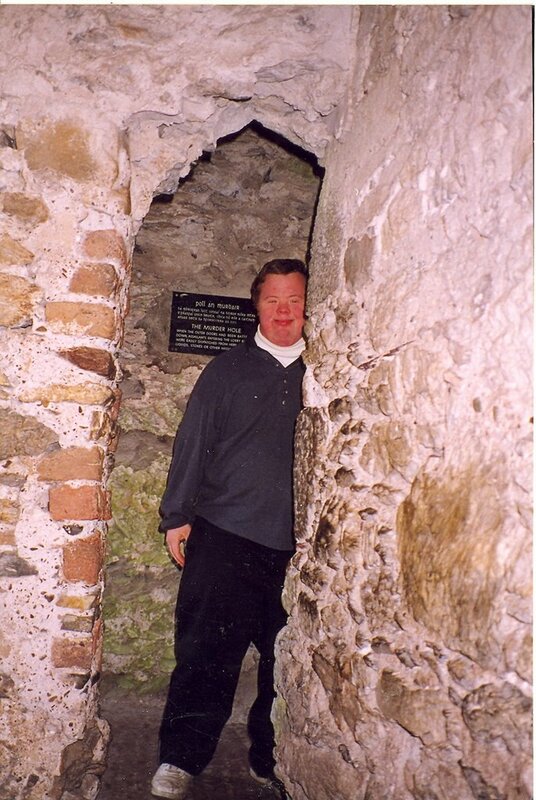 Ciaran studied at Tours and Rome, but chose to live as a hermit in the Irish Midlands. http://www.irelandseye.com/irish/people/saints/ciaran.shtm. This was the contemplative period and branch of Christianity. This period of calm service was not to last, however, once the vast Roman institutions took over, and when the effects of Christianizing northern Europe by force resulted in, or were amazingly simultaneous with, the Viking raids that decimated Irish monasteries for centuries. This was a particularly ripe one for the taking: a Cathedral, nine churches (10th-13th C), and two round towers, three high crosses, and early Christian grave slabs. 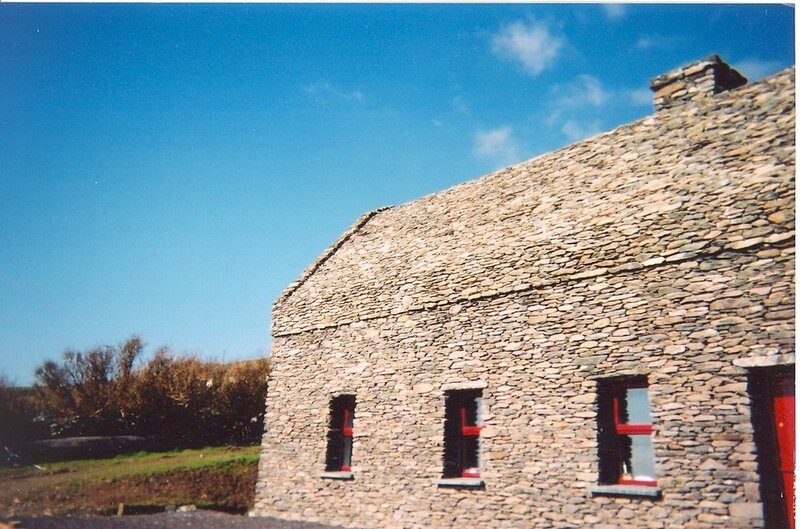 See Heritage Sites of Ireland, Duchas, the Heritags Service, Midlands East 2000. There are long, meandering rivers, like the River Shannon here. Cruise up in your Viking longboat, and make a swift attack. The monks can see you, but where do they hide except in their towers. Not for long. 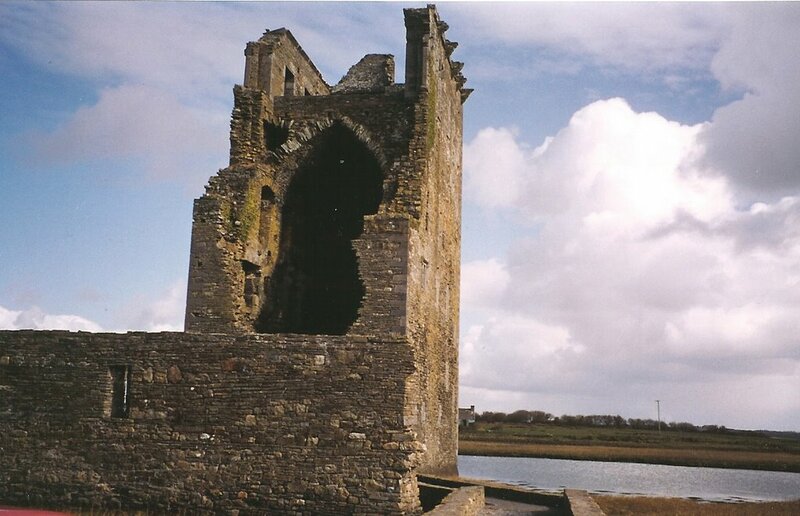 This is Clonmacnois, the old monastery, at the lower part where the river gently sloshes. Vikings regularly glided this way, and became very rich indeed. Beaches are stony, and cliff areas are there, but avoidable. So few defenses. Just move on up the coast a bit. Hit the rocks at the cliff areas in a storm and that is trouble, as the Spanish Armada found when they were blown off their course from attacking England. But a country easy to invade with its many long waterways doing deep. Geographical Determinism: This is an approach to history that focuses on how the land itself facilitates or discourages various invasions, product development, cultura. It takes a visual overview, and a mindset that adds observation of natural setting to the more usual archeological artifacts. then go to the history events - issues, timelines, maps, geneologies. Get a start on the topic at www.rootsweb.com/~irlkik/ihm/iremaps.htm. Is this like Montessori method, in a sense. Look at this example of a multi-disciplinary curriculum in order to really learn, at www.michaelolaf.net/1CW612geography.html. "History, geography, and biography—the history of a people cannot be separated from the possibilities of the environment in which it develops, and the leadership of its great men and women." 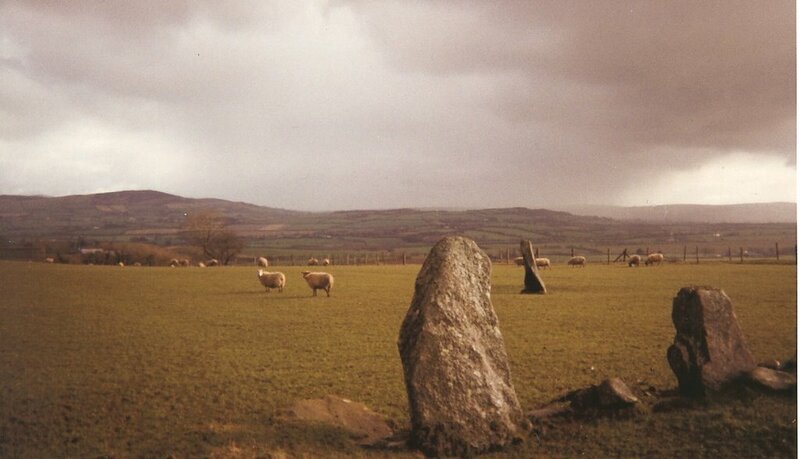 The stones at Beltony, near Raphoe, Donegal, are 2000 years older than Stonehenge . 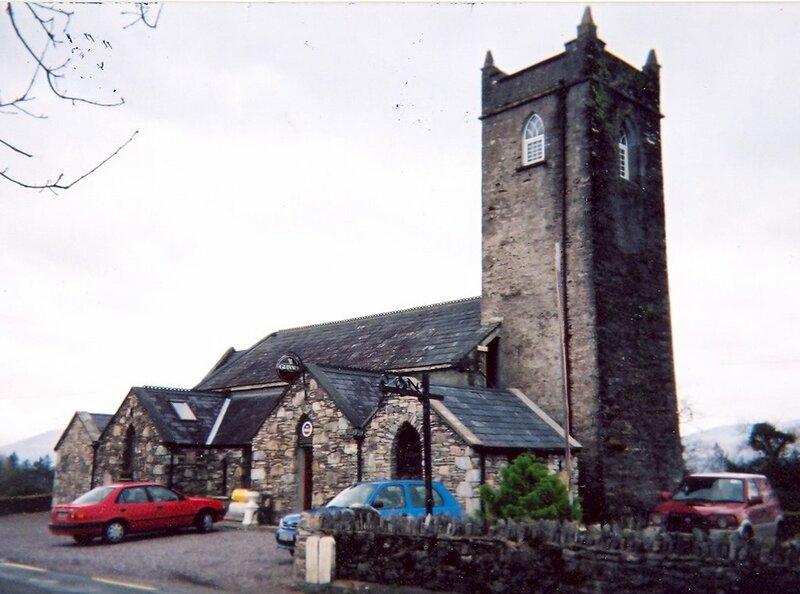 See the Beltony stones at raphoe.com/raphist/raphoehistory.htm#Southm. Wander around the vestiges of civilizations long before the Christian era. You can see little signs on the road with arrows pointing - when you get there, and it may be miles, the circle or lone stones may be right in the middle of a pasture. See Stones of Ireland at stonepages.com/ireland/ireland.html. Some places have a little tin box at the gate where the standing stones or stone circle area is on a farm, for a contribution for upkeep. Align with stars? show seasons? show movements of moon and sun? Other knowledge? The Glens of Antrim, on the coast, have a close connection to the Hebrides and Scotland. See http://www.geographia.com/northern-ireland/ukiant02.htm. The Island of Rathlin, some 18 miles off the Irish coast, at Ballycastle, is a ferry ride away, some 50 minutes. We chose to look from the Antrim side. People arrived about 6000-5000 BC and became blue-stone axe exporters, until copper took the trade. See the ballycastle site. In 1500 BC, the Firbolgs arrived, a dark race from Spain, it is said, known as "bag men" for their baggy trousers. But their reign was short: in 400 BC, the Celts moved in, with their iron swords, red-blond hair, tall stature. King Donn ruled in the 1st Century. Niall, in the 400's conducted raids and stole one Patrick (son of a minor Roman official) who became Saint Patrick. Then in 795 or so, after Charlemagne slaughtered thousands of Saxon prisoners who would not convert, Norse began their raids, starting with the monasteries. 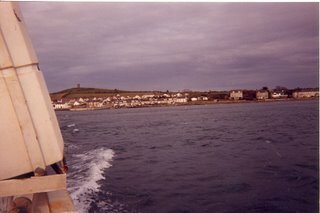 See http://www.ballycastle.free-online.co.uk/places/rathlin/rathlin.htm. That site is a clear presentation of the sequence of invasions and settlers. Continue there to the "grant" of Ireland by Henry II to deCourcy and etc. Rathlin is in the thick of it. Scotland is a short hop beyond Rathlin. See http://antrim.net/rathlin. You can see Scotland and the Island of Rathlin on a reasonably clear day. The compass markers show all you can see when it is not hazy. Read about Rathlin's long (bloody) history, much fought over. http://www.rathlin.info/. The background to the Norman invasion of Ireland is a long story, well laid out at http://www.teachnet.ie/mmorrin/norman/why.htm. 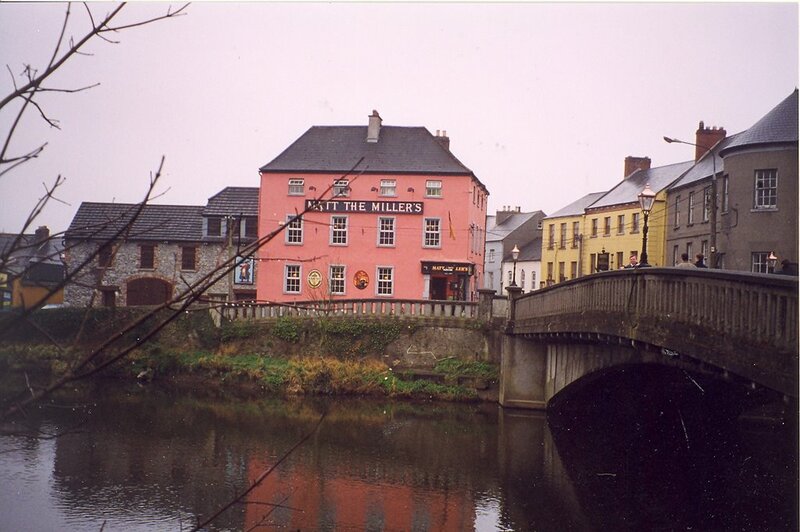 The history of this area, however, with Drogheda barely a mile away we think, extends back millenia. Read this venerable tourist-writing book, "In Search of Ireland" by H. V. Morton, see review at http://christine-breen-williams.suite101.com/in-search-of-ireland-hvmorton-a178724, from 1930, and later reprintings. Drogheda and Carrickfergus see pages 270ff. The Normans, after their invasion of England in 1066 with William the Conqueror, invaded Ulster (the north of Ireland) with a permission, then did not leave. The Welsh Norman Lord, Richard de Clare, known as Strongbow, acted to help restore the Leinster King to his throne, and in exchange for a marriage to the King's daughter, and other benefits of inheritance as to the throne itself. No wonder he came, with army. He also had permission of the English King Henry II, who had been asked for help by the deposed Leinster king and then turned to Strongbow to do it. A more complex account of Strongbow - worth reading - is at http://www.houseofnames.com/xq/asp/sId./kbId.129/qx/knowledgebase.htm/. For a quick review, see everyman's starting point for perspectives, at http://www.en.wikipedia.org/wiki/Richard_de_Clare,_2nd_Earl_of_Pembroke. The town was walled by the 1300's. The fine castle on the water is also called Carrickfergus. The first fortification on the site was apparently 150 years BC, see http://www.libraryireland.com/Belfast-History/Carrickfergus.php. Here is a fair use thumbnail of the site now, from http://www.photos.igougo.com/images/p239247. That castle was begun long before, in 1180, as a protection to Belfast Lough. Ireland and Europe show vast educational advantages compared to our isolation from so much history. Schoolchildren here learn history from their backyards. At this castle, for example, there are staging sets, exhibits, classrooms, mannequins, scenes, all showing Carrickfergus in 1180 and to now. See http://www.geographia.com/northern-ireland/ukiant03.htm. Turn the corner around from one of the staircases, and find the king, crown askew, on the loo, drawers crumpled at his feet, chin on hand, and school kids seeing it for the first time, giggling and pointing. Great fun. Carrickfergus is huge, like the photo of what now know is Caernarfon in Wales,* see note. Update January 2009 - We had originally posted this picture, but later found it is not Carrickfergus,but Caernarfon, that we also visited. See comment. My son and I are sure we a "Carrickfergus" but this was before memory cards. There are similarities between Carrickfergus and Caernarfon, but this one turns out to be Castle Caernarfon in Wales, where the Prince of Wales is customarily crowned. 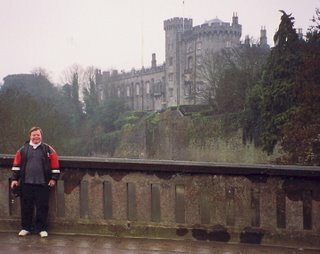 See Ireland Road Ways, Caernarfon Castle and the Prince of Wales. All information is a matter of pooling and checking. Vet it all. Thanks. The comment that first alerted us includes a picture of Carrickfergus so check it there. This castle, named Dunluce, is on the Antrim coast Northern Ireland. Its kitchens fell into the sea in 1639. See geographia.com/northern-ireland/ukiant03.htm. Seven cooks perished, but a cobbler survived. 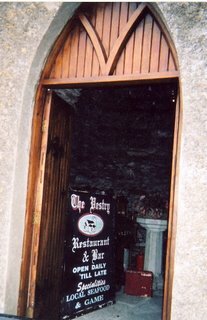 See www.donegaldirect.com/Site_WS_Business_Details.aspx?business_name=Dunluce%20Castle. As the lava cooled, it contracted into polygonal columns, some 4, 5, 6 sides. Some are 12' thick, some are 40' tall. Beginning at the top, fractures spread down in layers, with the cooling and contractions stressing the material. The hexagonal shape relieves the most stress with least energy. Meet Dr. Alberto G. Rojo and author Eduardo A. Jagla, Argentina. Their interest is in the patterns nature shows, Match an experiment with cornstarch. No, that is too technical and dull. Try this one. Dan Widing at the Giant's Causeway, County Antrim, Northern Ireland. Waiting for Finn. There was once a quarrel between two giants, named Finn Mac Cool and Benandonner. Benandonner built the causeway as a walkway from Scotland so he could do battle properly against Finn Mac Cool. The story has Finn posing as a baby in a pram, and the mother saying the baby is just Finn's brother - do read it all at ballycastle.free-online.co.uk/places/causeway/causeway. Science may be right, but myth never misses. These formations are from vast long-ago lava flows, see all the geology and history at northantrim.com/giantscauseway. The white tin on the rock means stop: walk no further. Or that someone tippled. This is a UNESCO World Heritage site. See whc.unesco.org/en/list/369. Meet Finn. See allaboutirish.com/library/tales/gcauseway.shtm for the myth. See also thesalmons.org/lynn/wh-england.html for the Giant's Causeway. This is a fine site with all the World Heritage sites listed. Scroll down to the causeway, and follow the links for history and geology. See also geographia.com/northern-ireland/ukiant01.htm for tourism information. This would be an excellent geo-tourism site because of the geological sites and attractions. See book "Geotourism" by Ross Dowling at this site: elsevier.com/wps/find/bookdescription.cws_home/706060/description#description. BELFAST, County Antrim, Northern Ireland. Titanic. There is a splendid transportation museum at Belfast, with full-size carriages and trains, and a model of the Titanic. Big exhibit. When we drove through the city, there were political symbols, and fists, and bombed out places. Banks transferring big canvas locked bags to armored cars had soldiers with machine guns guarding. We moved along smartly. After Belfast, we went down the peninsula rather than the mainland side toward Dublin, because we saw a ferry marking on the map. Rule: If you see a ferry sign, you have to take it. Ended up at Downpatrick. What is the source of the image, the red hand of Ulster. Find the Red Hand of Ulster, at http://travelpostersonline.com/. Read legends of Hebrew roots for the Red Hand, at http://www.johnpratt.com/.../ Thumbnails are supposed to be fair use, but we haven't the energy or funds to dispute a site's removal of even that. Look up the picture of the Zerah Red Hand, Old Testament roots, is from that site. Do an Images search. Daniel the Traveler here, is our famed co-Director of the ad hoc Car-Dan Tour Company, of (click) Europe Road Ways fame. He went to the bookstore, as his custom often. 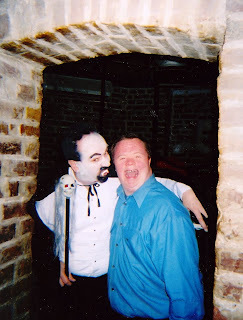 He found out that Bram Stoker, who wrote Dracula, is a Dubliner, born in 1847. We never knew that when we were there, or when we went to Romania, but here is corroboration: at the venerable BBC itself, at ://www.bbc.co.uk/dna/h2g2/A588233/. See our Romania site at Romania Road Ways, Vlad Tepes Sites. Apparently, Bram Stoker was shaped by horror stories of the cholera epidemic in Ireland in 1832, among other influences. He went to Trinity College in Dublin, and was athletic and a debater. He was a civil servant at Dublin Castle, and received an M.A. in Mathematics. After he moved to London, he qualified as a Barrister, but did not practice. "Dracula" - his most famous novel, published in 1897 - earned him zilch. He died in 1912. The point? That taking a young person to Europe, or other area where they have an affinity from vague roots, can leads to lifetime interests in the interrelationships among countries they have actually seen. Skip the summer camp. One parent, one child, go somewhere. Climb castles or whatever. Eat and sleep on the cheap. Life. Bram Stoker born in Dublin. Who'd 'a' guessed. July 13, 2008, page 11, New York Times. Do check the "36 Hours" series, this one on Dublin, for any major city - with luck, there will be a feature. You will find a handy map of the city, with the usual numbered bullets showing where the places are, and a fine series of paragraphs according to time and location. Start at 9, for example, after breakfast, at this place, and follow through the entire 36 hours - restaurants, culture, sights, night spots. From Belfast, take a break from driving and take an alternate route south: Drive the peninsula south to Portaferry, on Strangford Lough. Enjoy the waves across toward Downpatrick. Our rule is this: If you see a ferry, take it. That is the rule. Here, we knew there would be a ferry across toward Downpatrick, so there was no surprise change in route. Its history goes back to mesolithic man, some 7000 BC, see http://webcache.googleusercontent.com/search?q=cache:http://www.portaferry.info/History.html; with each stage or invasion represented, through religious changes, Norse, Cromwell. Strangford Lough itself is a Norse name -- Strang-fjord, says the site. If you have time to delve, there is a castle, and old church ruins. Portaferry ferry, Strangford Lough toward Downpatrick, Ireland. Portaferry does not go to Portadown, another place entirely. Portadown is a market town also with a long history, more prosperous since the 17th century, see http://www.portadowntown.com/about/heritage.asp. 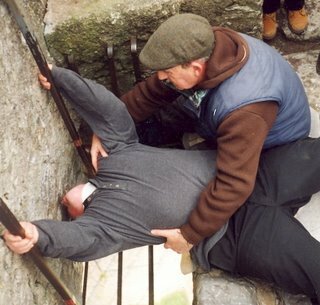 The "down" comes from old Gaelic for dun, or fortress, or fort. Place of the fort. The Cathedral at Downpatrick displays the gravestone allegedly of Saint Patrick, see http://visitdownpatrick.com/, where Saint Patrick is said to be buried. There is a large flat slabstone in front, with a depression where he is supposed to have laid his hands. Saint Bridget, see http://marshallco.net/axtell/stbridget/bridget-life.htm; and Columba or Columcille are also here. See http://www.saintspreserved.com/Colum/St_Colum.htm. Dublin: We ambled for a day, around St. Patrick's Cathedral and the River Liffey, especially interested in Bloomsday, James Joyce - whom we later met in Pula in Croatia. See Croatia Road Ways. Joyce lived in Croatia, among other places. Medieval Dublin is hard to extract from wandering the commercial city today. See medieval Dublin information at enfo.ie/leaflets/bs16.htm. Its history is at eiretek.org/chapters/books/Harris/contents. Fair use thumbnail from ://www.seattlenet.com/. What if early Christianity as brought to Ireland by the earliest religious, had been able to prevail against the might of the Roman branch -- and its Gregorian Reforms, see http://individual.utoronto.ca/hayes/survey2/03_gregorian.htm. The militant, organizational, creed-driven group out to change the world according to its view overwhelmed the local faithful, the meditative, the merely "doing good". History only tells us what did happen, not what might have changed in our own lives with other outcomes. Saint Kevin. Naom Caoimgin. Sound out the Gaelic. Saint Kevin, died 617-18, established himself and began a monastery, and signs point that it was here, at these ruins. But written accounts were set down centuries later, these date to before 800 but not as early as 550-600, so where the first structures were, more confined, between the two lochs, or lakes, upper or lower part of the valley, is not clear. Other, older sites with huts, are steeped in other traditions of holiness and burial place of kings, nearby. The round tower here is probably 10th century, the time of the Viking raids. See the Sea Stallion of Glendalough, Roskilde, DK reconstructed. Danes and Norse: plundered Dublin, Kildare, Glendalough in 837. 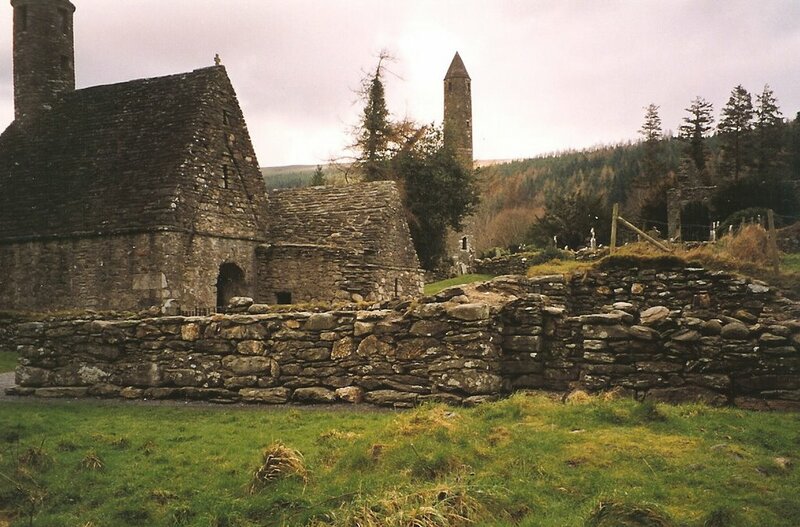 Then the indigenous, native Irish plundered Glendalough in 983. And in 984-85, the Danes were back at Glendalough; and again in 1012, 1016. 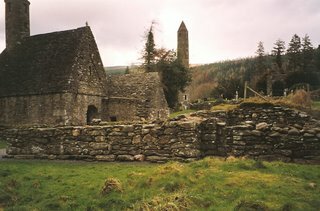 Between 1017-1163, Glendalough was "ravaged seven times", Noonan at 23. There are also prehistoric tombs in the area around Kevin's hermit cave, or Kevin's Bed. His arrival there could be geared to dispensing with old superstition, including regarding causing the death of a powerful witch named Caineah or Caoineog, who tried to harm a son of a king sent to Kevin for fostering. Ireland's connections with Spain and Portugal are also known, Noonan at 17, and some legends may stem from those contacts. 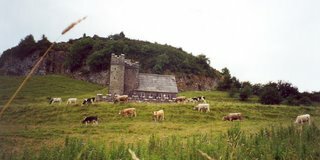 There are many old monastery ruins in Ireland This complex at Glendalough, in County Wicklow, is one of the most famous, see a virtual tour at http://www.faculty.de.gcsu.edu/%7Edvess/ids/medieval/glendalough/glendalough.shtml. This place represents a golden age for creativity and self-direction in religion - Celtic Christianity, before the rigid institutions, exclusions, and authority of the Roman church took over. Linear thinking cuts like a machete through the gentle tolerances it finds, and abhors. Is that so? 1170 -- These reforms in turn led to the Norman Invasion, through one Diarmuid MacMurrough and tawdry events of reprisal and revenge, and treachery in his bringing the Normans into the country, see Noonan at 25. Again Glendalough was sacked. This time, by the Normans. Henry II followed up with assertions of "grants" and control, Normans again in 1174 sacked Glendalough, and Henry II himself invaded Ireland in 1175. More plunder, and a flood. Politics, Pope finally affirmed the "grant" that had been opposed by the local Thomas O'Toole (back to the original revenge reprisal issue), and competing "grants" by Pope Innocent vs. Prince John. More attacks, English this time. A confusion of history, who is entitled to what. The Noonan guide is comprehensive. PP 27 ff. The Normans represented state interference in church appointments, the old times celebrated independence of the clergy, then came the Pope with new interferences in old ways, but through the church branch he represented. Many large Orders were introduced, with Rules. English archbishops were anathema to the Clan O'Toole, and so on. 1398-1497 - Celtic bishops held the See of Glendalough by "usurpation" it was called, and with permission of the Popes, and the local clans, but then the English archbishop system prevailed, the last bishop of the "usurpation," a Friar named Denis White, surrendered in 1497 to Archbishop Fitzsimons. So: What if the Gregorian Reforms, see http://www.britannica.com/EBchecked/topic/245503/Gregorian-Reform, with the militance of the Roman branch had confined itself to Italy? No way. So down came Ireland, into systemic violence. Is that so? Vinegar Hill, a sign on the road south east from Glendalough, on way to Wexford. So we went. See Battle of Vinegar Hill at answers.com/topic/battle-of-vinegar-hill; and the BBC on Vinegar Hill at bbc.co.uk/history/british/empire_seapower/irish_reb_06.shtml. I believe this was the view from the top, as the hill is not very high, but it looked like this. No place to try to defend, but the only one around. Vinegar Hill turned out to be a significant one-sided battleground - between the Irish lads with picks and farm tools, against the English firearms. You can climb the tall hill. A statue of a lad with a pike stands in Wexford. At this site, you can print out the words, then click on the music and sing about the heroic Father Murphy, who sided at first with the English, then saw the devastation and became a hero for the Irish and gave his life with the lads. See Father Murphy at musicanet.org/robokopp/eire/atboolav.htm. The issue of loyalty to the British or siding with the Irish shattered families. Sons hung for fighting were ignored by some parents, just as in any deep civil divides. This is an unnamed elder in our family stuff, not Irish, but he looks like the kind of older generation steeped in commitment to the values in which he was raised. And perhaps he did not participate with Father Murphy. Maybe he did. There is a fine statue of a young man with his hopeless pike to fight against the English, at Wexford. On a happier note, that tourist website there gives some basics on Irish cooking: Try wexfordtourism.com/recipes.htm. Kilkenny - old capital, seat of a parliament. See long history at rootsweb.com/%7Eirlkik/kilhstry. One side of our people came from Kilkenny in 1820, but they don't appear on the landowners' map of 1640, see landowners at Kilkenny at rootsweb.com/%7Eirlkik/landomap. so fine indigenous folks with long roots in Kilkenny they were not. On the other hand, we later learned that Skarf and spellings derived, were in Carlow - starting with "Red" in the 16th Century, first recording. Next trip: to Carlow. Not far. See ://www.bytown.net/wexlist.htm/. Perhaps we were Viking invader/settlers. See the fine site on Vikings in Ireland at vikinganswerlady.com/Ireland.shtml. And the map of how far they had come into Ireland even by 800 AD. rootsweb.com/%7Eirlkik/ihm/ire800. And then more on Viking settlements at rootsweb.com/%7Eirlkik/ihm/ire900. Dad's family -with the unlikely Irish name of Scharf - came from Kilkenny. They went to the Ottawa Valley area, Canada, in 1848, and the surname Scharf seems to be from the Old Norse for "cormorant." We claim the Vikings. This is the Butler Castle, no relation but a prominent, philanthropic family, Kilkenny. There are many old Irish names with the same Old Norse root - Scariff, On Scairbh. County Clare. See roots of names post at Old Norse roots, Ireland. Places: irelandmidwest.com/clare/towns/Scariff. There is a Skarfskerry in northern Scotland, near Orkney. See Scotland Road Ways and Orkney Road Ways. There is also Otkell, Son of Skarf in the old Icelandic sagas. Burnt Njal at Otkell Son of Skarf. See ncte.ie/viking/ for more on Vikings. From that: Vikings have been in Ireland for over a thousand years. They/we settled in at mills and farms, as well as vacationed from the old country plundering it up. We are indeed full Irish. And the odd name, Scharfe - now with an e so the Canadian postmaster in 1900 could differentiate between families - fits. At last. A quasi-identity ersatz heritage. Look up any odd Irish name - it also may be Old Norse. See post at Old Norse roots, Ireland. Give out the helmets with horns. BARE BACK WITHOUT BROTHER BEHIND IT." Foegin. Feginn. The motto on the shield. Does this mean that Fagan the Pickpocket Gang Leader in Oliver Twist was Old Norse, perhaps in the Norman invasion of England, (the Normans being Norse) or with the English further into Ireland with Strongbow? What's in a name. For recreation, see ://listsearches.rootsweb.com/th/read/IRL-CARLOW/1999-11/0941511106/. Baby names. Skip the baby sites, at ://www.thinkbabynames.com/meaning/1/Fagan/ They are pablum. Get back to the grit. Vikings, Normans, yes! See Orkney connections at Orkney Road Ways, Finding New Roots. Kinsale - A port, southern coast; military stronghold. It also is a center for the arts, history. Kinsale as a culinary center supreme attracts professional and amateur foodies. See http://www.cork-guide.ie/kinsale . 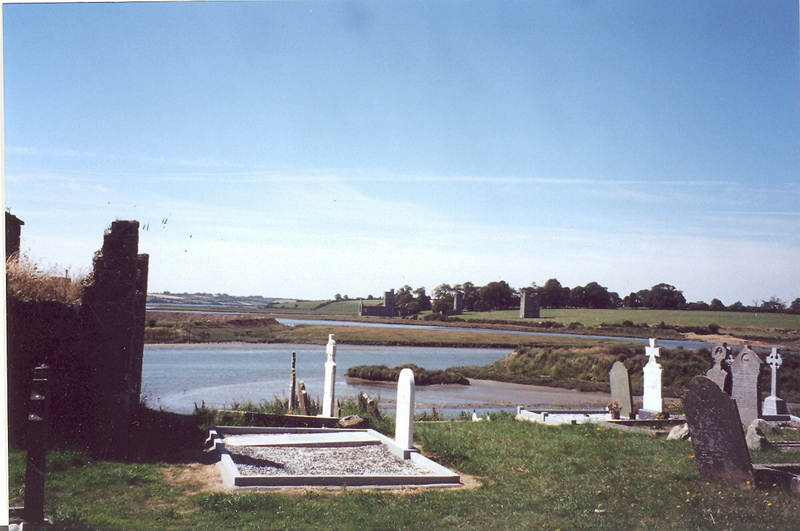 In 1601, the Spanish and English defeated the Irish at the Battle of Kinsale. Hugh O'Neill had made the error of moving his Irish troops into Kinsale to fight, and there was a rout - followed by the Flight of the Earls in 1607 - marking an end of the Irish hopes of independence at the time. For the sad tale of the Flight of the Earls, see http://www.irelandseye.com/aarticles/history/events/dates/earls.shtm. Find contemporary documents about it at http://www.celt.ucc.ie/index, a "Corpus of Electronic Texts (CELT)". A section concerning the Earls is found at http://www.ucc.ie/celt/published/T100070/index. What would have been different if they had not fled, on their ship with all those families, out of the Lough in Donegal? Would there have been ever a Plantation, where the Crown planted English, Scottish and Welsh families on escheated lands of the Earls, forfeit? The Earls would have been compelled to live in vastly reduced circumstances after the victory of the English in the rest of Ireland, with their Ulster only remaining, and dominated. But would that have been better for the Irish? Cork: history at enfo.ie/leaflets/bs31. We enjoyed a day there, but prefer country to cities overall. This stone fort is built with no mortar at all, and still stands. The area also has standing stones, and burial mounds. Soon the forms become familiar. 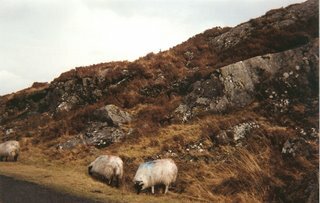 See prehistoric structures at http://www.irishmegaliths.org.uk/seanchlocha7.htm/ There are fine photos and history here. This fort is round,with a large circle of high walls and walkways, and rooms within the walls, space for villages and livestock to find refuge from invaders, coming up from the sea in the distance. 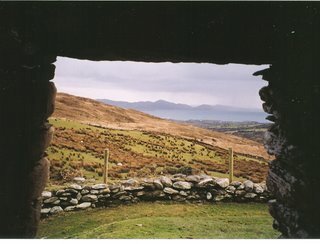 See Ireland's archeology at http://www.mockingbird.creighton.edu/english/micsun/irishresources/archaeol.htm. history of Ireland, with maps: http://www.rootsweb.com/%7Eirlkik/ihm/index.htm. Get to the farthest-out points in a country, as far as you can get - we aim for the extremes: see John O'Groats in Scotland, and Land's End in England. And Gdynia, Poland. Sapanta, Romania. Blarney for most is a delightful experience. Famous castle. 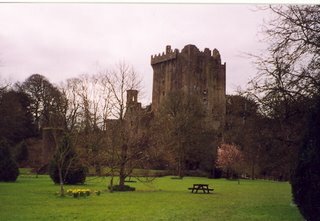 See blarneycastle.ie. Such a fine place to come back to the parking lot, and find the luggage gone. Infamous to us. A little theft to spice the day. So, let it go, contact the police, do the forms, it all works out. Buy another chapstick. For stolen or lost passports, here are the contacts: travel.state.gov/law/info/info_623. There are ways to expedite. See passportsandvisas.com/passport/lost.asp. Parking lot protocol. Never, ever, leave a window cracked open even a little. And put away the maps and junk. You will be identifiable as a tourist from the license plate, but you will be a less stupid one. At least one of you keep cash, a plane ticket and passport in a waistpack. If you do see a red van in the lot, with people eying you out of darkened windows, park instead right at the ticket booth. The lady is in my tan 9 1/2 hiking boots. And now: The Stone. Blarney is famous for its Blarney stone, and there really is one. 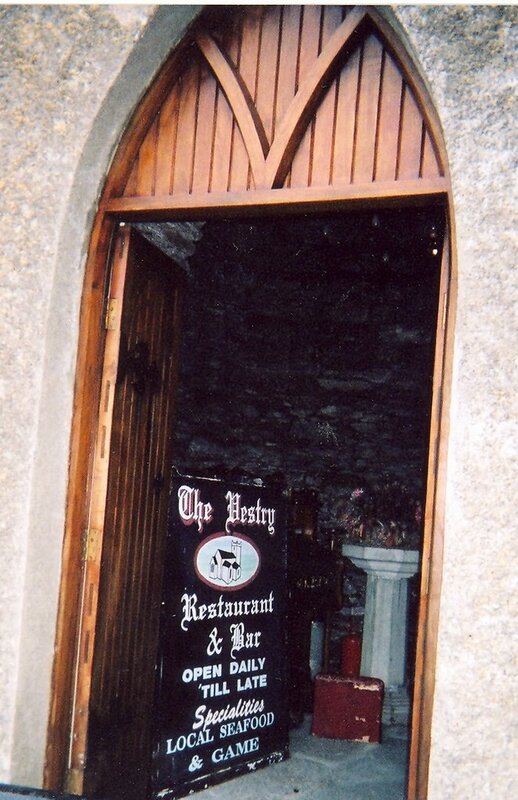 Here is a site for the history of the stone, and the gift of gab it bestows: sacredsites.com/europe/ireland/blarney_stone. Don't even think how many lips have kissed that thing. Just be romantic. We cheered our immune systems on. We worried not a whit about germs in the great outdoors. But far better for our historical research purposes is the Murder Hole: See castlesontheweb.com/glossary. This bit of architectural military defense brilliance is just inside the portcullis, the grated big gate that lowers just over the drawbridge. There is a matching grated gate about 20 feet beyond, before you get into the main courtyard. You are trapped. Then, look up. There is a hole up there. And people about to pour boiling water and oil and rocks, and sling arrows upon your head. In some castles, the tale tells of the women in the solarium, the large room on the sun-side of the castle, looking down to the great hall beneath, and with big fireplaces for themselves and children. The women heated the water and hurled the stones as needed. 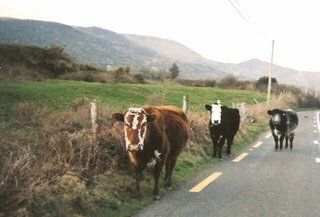 There are several western-reaching peninsulas in south-western Ireland: The Dingle Peninsula, The Inveragh Peninsula with its Ring of Kerry route; and the Beara Peninsula, West Cork. We focus here on Kerry. These areas are touched by the Gulf Stream, with all the varieties of plants, animals, that allows. 1. The Dingle, the northern peninsula, is less traveled, and we think, the loveliest. Start at Tralee, and go all the way out past the town of Dingle, and see views of Great Blasket Island and the Atlantic. 2. Beara Peninsula, the southern one, boasts Mizen Head, the farthest Irish point tip south, out in the Atlantic . We went through Bantry, visited Mizen Head, then back to Skibbereen at its southern access route on the mainland. Start early - before 10, if you plan to stop and enjoy. We misjudged the time we would want and got back through a mountainous area at dusk. Not a good idea. If you are late starting, then do the mountain area first, with the flatland at dusk. On the way there, see signs of changing times. Repurposed churches without congregations but with new uses. These were near the Ring of Kerry, Dingle Peninsula, but still on the mainland. One repurposed church is now a fitness, exercise center. 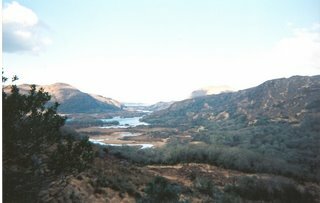 Templenoe, Kenmare, Ring of Kerry, Ireland. Repurposed church: pub and fitness center. People who live in stone houses should never throw glass. This is an active residence, with stone walls and a fully stone roof. Stone roofs like these are not mere stone tiles. The closest close-up picture I could find for these free-form stone is from Croatia at treklens.com/gallery/Europe/Croatia/photo191489.htm. I see that even modular homes in US are being made of stone, with interesting construction t echniqes like slipform. See US stone construction at hollowtop.com/cls_html/do-it-yourself/stone_masonry.htm; and at northcoast.com/%7Etms/stone.html. No connection to these people, just interesting to read what they do. 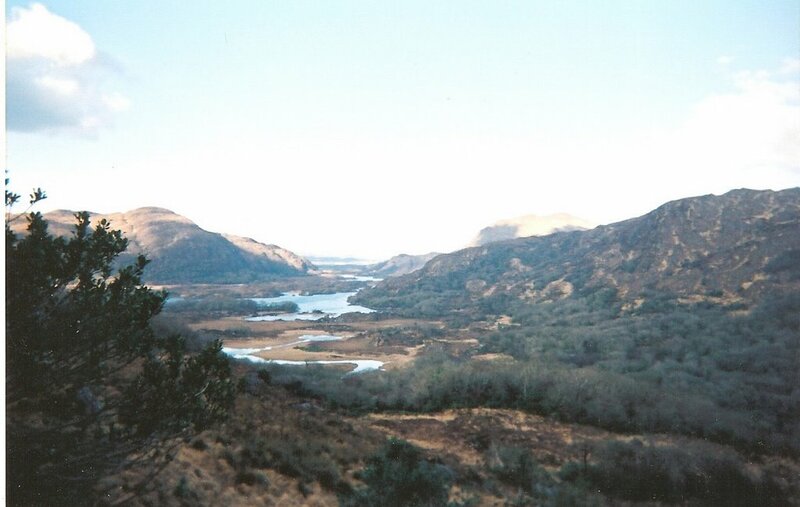 The Ring of Kerry is a scenic route around one of the peninsulas south of Limerick. See Ring of Kerry, with music, at http://users.zetnet.co.uk/gsivills/gskerry.html. 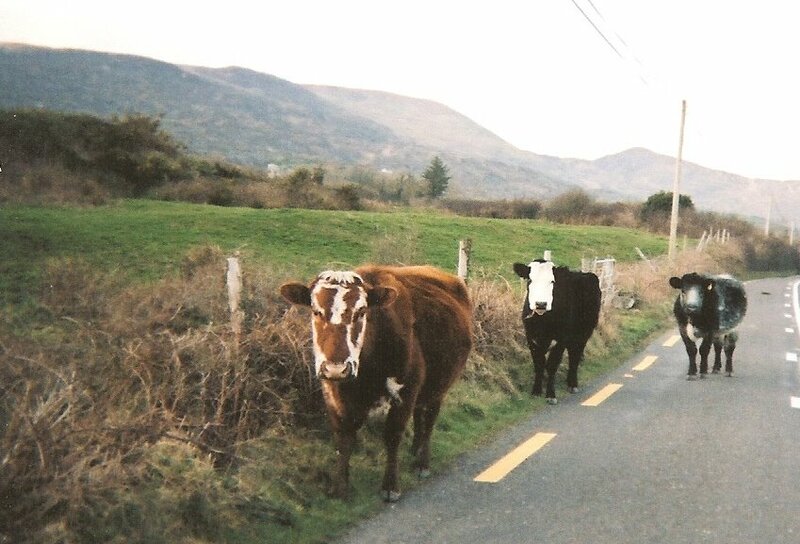 Here, folks having a good time: http://jessajune.com/photos/2002/ireland/ringkerry.html. We started with, "See a castle, go in." But that is impossible. Too many. Take care. They are wide open, no guard rails, no nothing. Roads are excellent between main towns - many motorways, but most are 2 to 2 1/2 lanes. Animals are leisurely in the road. Sheep and cattle, some goats. Markings of red or blue are for ownership. They do not move. We saw none hit. Drivers take the necessary care. Mantra for driving on the left: Center line to the right elbow. Center line to the right elbow. Roads: see driving in Ireland at iol.ie/%7Ediscover/driving.htm. Watch your left hubcaps. Easy to hit curbs. See also rules of the road at driving.drive-alive.co.uk/driving-in-ireland.htm. Passing on one lane roads: Watch for the tall flag that means a lay-by. When you see a car coming, the car nearest the lay-by backs up, or pulls over and waits. Car behind will tailgate. This is not necessarily rude. Tailgating usually signals a desire to pass. The slower car pulls to the side, over halfway on the berm and keeps driving while the faster car whips out and partway over the middle line and passes, then whips back. Passing is done fast with little leeway. The passing car should not have to go entirely into the oncoming traffic lane at all, as we always do. Traffic circles. The one in the circle has the right-of-way, so never barge in. Learn the international traffic signs. Your guidebook should have a page on that. They are not necessarily intuitive. This Tipperary site was the seat of Kings of Munster as early as the 5th century, when Saint Patrick baptized King Aengus. See Cashel overview at http://sitesatlas.com/Europe/Ireland/RockOfCashel.htm. Then the Rock site was given to the Church in 1101, and it became an Abbey. Cromwell's soldiers and cannons from England came in 1647 and there was a massacre. See http://comhaltas.com/bru/Cashel.htm. It is restored, much of the medieval section is standing, and the guides help sort out the Romanesque from other architectures. Films, education centers. See photos at http://bamjam.net/Ireland/Cashel.html. Ruins of past lives. See many ruined homesteads, churches, abandoned settlements. A church in a field with the flock outside, not inside. Look at the depopulation figures from 1849-1901, at ://query.nytimes.com/mem/archive-free/pdf?_r=1&res=9C05E5D61F38E733A2575AC2A9609C946097D6CF/ From eight million souls to three million in that time, roughly.